This has a very sweet Body with an herbal, almost cola flavor. Vanilla stands out as well. There really isn’t much Bite other than the carbonation, but it isn’t overly smooth either. The Head is as good as it can be. So tall I have to pour with caution; lasting throughout the whole drinking experience. The Aftertaste is light and cola-ish. Is it from filé powder? So really cola like and sweet. Not anything like the vast majority of root beers I’ve ever had. But, this reminds me of Barq’s, a lot. And Barq’s was made in the late 1800s and is also from Louisiana, so I’m thinking that this was their target from the beginning. It is better all around than Barq’s, plus it’s caffeine free, but it’s still a little too far outside of the standard root beer spectrum for me. See how it rates against other root beers. After nearly 20 years of the same design, Barq’s is going back to their roots in a graphic way. They’re redesigning their packaging to look more like the classic glass bottles (which I’ve already noted are pretty awesome). I must say that I’m impressed with the new theme, especially with the glass bottle six-pack. Now if they’d just make those six-packs available to more of the country, then there would be a huge reason to celebrate. See the press release below. ATLANTA, Feb. 16, 2012 – Like any true classic, Barq’s keeps it fresh while staying true to its roots. 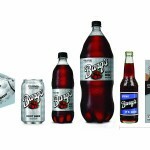 In its first redesign in more than 20 years, Barq’s root beer is unveiling a completely new look to pay homage to the brand’s Gulf Coast heritage and classically crisp, bold flavor. The new design will be featured on all of Barq’s packaging and is currently rolling-out nationwide.